Imagine booking one trip to visit all that you have dreamt of about Europe. Roam around the streets of Paris, the most glamorous city in the world, and see the lights of the iconic Eiffel Tower twinkle like a romantic beacon. Go on a cruise in the beautiful canals in Amsterdam. Get a chance to explore the German hospitality and visit the magnificent Cologne Cathedral. Get immersed in the beautiful earthly paradise that is Switzerland, getting mesmerized by the Swiss Alps and the stunning views. Europe has a lot to offer, and you will get to experience a whole lot of it in this unforgettable trip! Welcome to the most romantic city in the world! 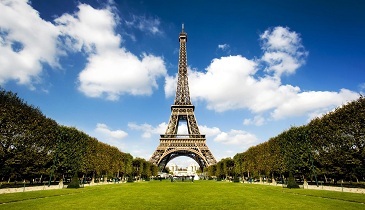 The epitome of love, charm and fashion, Paris is undoubtedly the most glamorous destination in all of Europe. On arrival, you will be met with our local representative at the airport, outside the customs area. After your pick up from the airport, you will proceed to a carefully chosen Indian restaurant for dinner. After the dinner, you will check in to the hotel. After a sumptuous breakfast at the hotel, we will proceed to visit the most famous landmark of Paris - the magnificent Eiffel Tower. We will get a bird’s eye view of the beautiful Paris from an impressive height of 377 feet, from the second level of Eiffel Tower. After this, we will go for a magical river cruise of the Seine River. After this invigorating cruise, we will begin our city tour of this historic city, exploring Paris and all its iconic and glorious sights! We will visit Champs Elysees, one of the most famous and glamorous boulevards in the whole world, with iconic stores and impossibly beautiful cafes lining the street. We will visit the wonderful opera, the gorgeous Town Hall and the National Assembly, we will see the famous Louvre museum (from the outside), the legendary Notre Dam cathedral and the Arc De Triomphe. After a lavish dinner, we will proceed back to the hotel, or you can choose to watch the Lido show- one of the most famous and long running shows in Paris (at an extra cost). With exotic, glamorous dancers, beautiful setting, foot tapping music, scintillating costumes and a beautifully racy atmosphere, this promises to be the quintessential night out in the most dazzling city in the world! You will be taken to the hotel after the show. After a hearty breakfast, we will check out from the hotel and drive to Amsterdam. We will check in to our hotel, and after freshening up, we will set out to tour this happy, carefree city. We will get acquainted with this city of canals through a canal cruise. We will also visit the Royal Palace and the Netherlands National Museum. We will then proceed to a carefully chosen Indian restaurant for dinner. After the delightful dinner, we will reach back our hotel. After a sumptuous breakfast at the hotel, we will leave for Germany. We will stop at the quaint city of Cologne, and visit the famous and beautiful Cologne cathedral. This massive gothic church took more than 600 years to build, and is a testament to the beauty of erstwhile excellence of the European architecture. 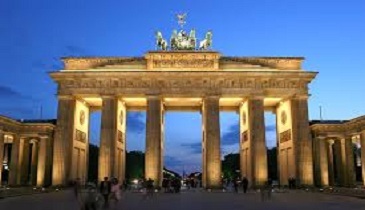 It is, understandably, the most visited sight in all of Germany. After visiting this iconic monument, we will proceed to dinner at an Indian restaurant. Post dinner, we will check in to our hotel. After a brilliant and hearty breakfast, we will check out from our hotel and proceed to the stunning Switzerland. We will visit the hauntingly beautiful Black Forest in Germany. We will visit the Drubba village, the original makers of the famous cuckoo clocks. We can see how these are made, and get a chance to buy them as unique gifts or souvenirs. We will later drive to Rhine Water Falls, Europe’s most powerful water falls! The sheer force and the thundering beauty of these falls will make this a memorable experience. On arrival to Switzerland, we will proceed to an Indian restaurant for a delightful dinner, after which we will check into our hotel. After a brilliant breakfast, you can explore the beauty of Switzerland at your own pace. You can get wowed by the breathtaking views of this paradise on earth, indulge in some shopping, delight in the culinary masterpieces of Switzerland, walk around to take in the stunning surroundings or ride in the public transport system. You are free to relax and enjoy the city on your own. 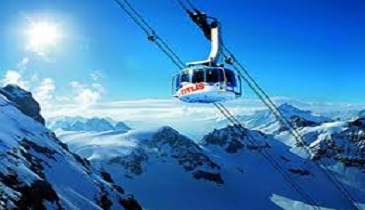 We would recommend a full day excursion to Mount Titlis with Ice Flyer, the famous cable cars to reach the top of Mount Titlis, and the fantastic Lucerne City tour (at an extra cost). At 10,000 feet above the sea level, Mount Titlis is the highest peak in Central Switzerland, affording a view which is unmatched by any other peak nearby! We reach the peak by changing three cable cars (ice flyers), with breathtaking views of the majestic Swiss Alps sweeping past us. Once we get to the top, we will get some free time to relax, take in our beautiful surroundings, play with the snow, or relax at the café or visit the Ice Cave. After spending a few hours in this magical area, in the afternoon, we will proceed to the picturesque Lucerne. We will get to know the city intimately with a city tour, which would take us to the Kapellbruck Bridge and the famous Lion monument. We will get some time here to shop for some famous Swiss memorabilia like Swiss chocolates, Swiss army knives and Swiss watches. Later in the evening, return to your hotel after having Dinner at Indian Restaurant. After a sumptuous and hearty breakfast, you are free to spend the day as you deem fit. You can laze around in the bed, or just marinate in the beauty if arguably the most beautiful city in the world! We can immerse ourselves in the beauty of the Alps, and visit Jungfraujoch and the Interlaken (at an extra cost). We will drive through the exquisitely picturesque views to Grund/Lauterbrunnen, from where we will board a train to take us to Jungfraujoch. The train ride in itself is uniquely pleasing, as it takes us from twists and turns and tunnels and mountain passes in the great Alps, to the Jungfraujoch station, the highest altitude station in all of Europe at 11,333 feet. Get enchanted with the magic of the Alps at the Sphinx Terrace, see the stunning views from Jungfrau Peak, and watch the remarkable Aletsch Glacier. We will also visit the spectacular Ice Palace, where we can see incredible ice sculptures, while incased in ice ourselves! The whole experience of ice and snow on the plateau is unforgettable and quite surreal. We can send postcards to our friends and family from here, the highest altitude post office in all of Europe. You can enjoy a brilliant lunch at an Indian restaurant in Jungfraujoch on your own. We will return via the Interlaken City. You will have free time at your disposal here, to roam, shop for the famous Swiss chocolates, Swiss watches and other memorabilia, or simply explore the beautiful cafes here. From here, we will proceed to the hotel after having Dinner at Indian Restaurant. Above Itinerary is just indicative, do not consider it as a Final Schedule. It can be changed or swapped or rerouted. Date & Time of Tours can be changed by Local Agent / Tour Operator. Any Driving distance mentioned in the itinerary is tentative, actual time may vary depending on traffic condition and various other factors beyond our control. This is a Group package & if you make any amendment, your services & price will differ from that of the existing package. This package cost is based on national EUR rate at Rs. 78/-, the bench mark rate taken uniformally as EUR is too much volatile and can’t be changed in itinerary / handout frequently. This is the HDFC Bank TT Selling rate taken at which the Bank will be making remittance to vendors abroad through Telex Transfer for land-arrangements etc. Please don’t get confused with the Inter Bank rate or Currency buying / selling rates being quoted on Currency rate sites or Bank’s Currency trading site. If Visa get rejected for any Reason Minimum Rs. 25,000/- per person will be deducted towards processing from your amount before 30 days of Travel (Within 30 Days of Travel date Visa rejection Charges as per Cancellation Policy). Need Visa Document within 07 days after Booking in such a way that visa is processed at our end 45 clear days prior to date of travel. Due to operational reasons, the routing of this tour may be amended. However all mentioned services will remain unchanged. As hotels / Flights / Itinerary / Route are subject to change without notice, no compensation will be paid for changes. Tour operated subject to minimum 20 passengers. You must be in possession of a valid Multiple Entry Schengen Visa. The cost of this Visa is included in your tour price. Some Consulates may request for a personal interview. You will have to attend this Interview. The Service Voucher(s) along with air-tickets and other travel documents would be given to you 4 days prior to the departure, only on payment of full tour cost including foreign exchange component 30 days prior to the departure of the tour and adherence to the schedule of documentation by you. If the booking is accepted less than 30 days prior to departure, you shall make full payment of the tour cost including foreign exchange component and deposits at the time of booking. Tour cancellation charge as per Below cancellation Policy. Any increase in rate of exchange leading to an increase in surface transportation and land arrangements which may come into effect prior to departure. The tour price is subject to increase without notice if this rate changes substantially prior to departure. If cancellation is made any time not less than 46 days prior to departure, Rs. 25,000/- shall be deducted. If cancellation is made 45 to 15 days prior to departure, 40% of tour cost or Rs. 70,000/- (whichever is higher) shall be deducted. If cancellation is made 14 to 08 days prior to departure, 75% of tour cost shall be deducted. If cancellation is made anytime within 07 days prior to departure or In case passenger is no show at the time of departure, 100% of tour cost shall be deducted. In addition to the above, in case of cancellation of tour by either party, the amount spent by the Company on visas, medical insurance, POE including administrative charges would be payable by the Client. If the total cancellation charges mentioned above exceed the amount paid by the Client, the balance amount would be payable by the Client. In case of Third Party Products (EU Rail, Cruise, etc.) the rules relating to cancellation and the cancellation schedule prescribed by the concerned Third Party Service Provider would be applicable and in addition the Company shall have the right to claim service and communication charges. Jewels of Europe Option not available online please contact us for more details.